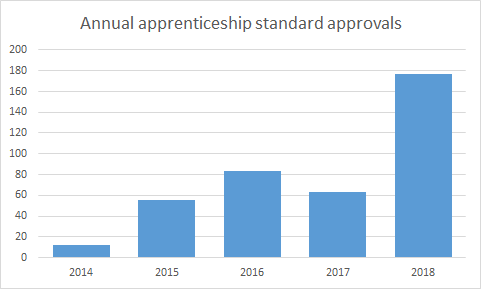 The number of apprenticeship standards approved for delivery is set to hit 400 next week, a little over a year after the Institute for Apprenticeships vowed to get ‘faster and better’. The milestone also comes just six months after it passed the 300 mark, and two months ahead of the institute’s own target date of April 2019. Currently there are 391 standards approved for delivery, with a further 12 waiting for final sign-off on their funding band – including three FE teaching standards, which FE Week reported today are set to go live in the next week. A further 267 are at various stages of development – meaning that the number could soon approach the “700 or 800” total standards predicted by the institute’s former boss Peter Lauener back in 2017. The institute’s current chief executive, Sir Gerry Berragan, has previously compared the number of standards ready for delivery with those of “very mature apprenticeships systems”. “Switzerland has 249 standards and Germany has around 330,” he said last year. The pace of approval has more than doubled since the IfA launched its ‘faster and better’ programme in December 2017. That initiative was billed as an assault on government red tape, and was specifically designed to streamline the approvals process, following complaints from employers that it was too slow and bureaucratic. As part of this ‘faster and better’ drive, the IfA’s 2018-19 business plan included a target of 400 published standards by April 2019, noting that it should have “due regard to appropriate coverage of the occupational maps and the priorities and diversity of the modern economy” in reaching this target. A total 183 standards were signed off in 2018 – an increase of 114, or 180 per cent, on the 2017 total of 63. 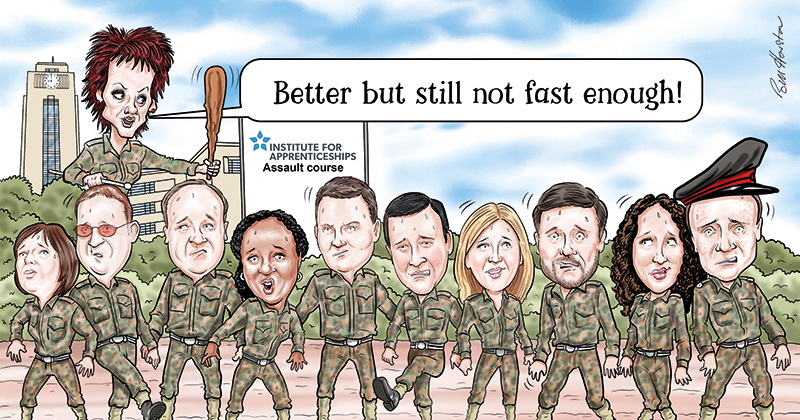 Speaking to FE Week in June last year, and the skills minister Anne Milton said the institute had “definitely got faster and better” but was “probably not yet” fast enough or better enough. “I have been in there with a big stick,” she said. The latest Department for Education statistics showed that only 264 – or around two-thirds – of the standards currently approved for delivery actually had starts in the first quarter of 2018/19. And around a third of the 391 have yet to have anyone approved to carry out the end point assessment. Furthermore, the proliferation of standards has attracted criticism from some quarters. Tom Bewick, chief executive of the Federation of Awarding Bodies, has urged the government to take stock of the number approved, warning that it would soon overtake that of “leading apprenticeship systems” such as Germany. “An apprentice being trained to carry out a ‘job role’ is not the same as one being trained to work in a whole industry,” he said in July last year. Lord Sainsbury called for a review of “all existing apprenticeship standards” at “the earliest opportunity” in his report on technical education in July 2016, but this has yet to materialise. A limited review of 12 standards in the digital sector began in September last year, the outcomes of which were promised “in the New Year”. An IfA spokesperson told FE Week today that this review was “progressing well” and that the results would be announced “in due course”.